Where Does Donald Trump Stand on College Affordability? 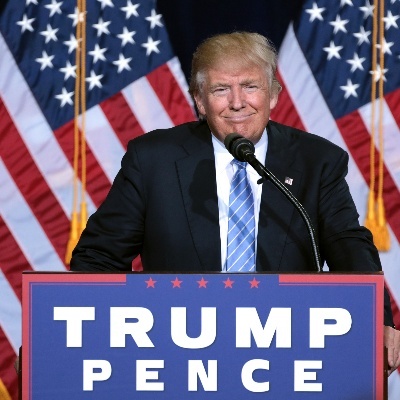 Home	// College Savings 101 // Articles // Where does Donald Trump stand on college affordability? Earlier this year Democratic Presidential Candidate Hillary Clinton issued an extensive proposal to address the rising cost of higher education, as well as outstanding student debt. What is the response from Republican Presidential Candidate Donald Trump on the growing crises in student debt? At a July 27th press conference, Trump announced that his campaign would release a "great plan" in the next four weeks addressing the affordability of a college education. The Trump campaign has been relatively quiet on the topic since that time. However, there has been some guidance from the Republican Platform, Trump himself, and campaign staff to give an indication of what we might see in a college affordability plan from a Trump administration. Keep in mind, though, that this is speculative. Limited government involvement – Trump has repeatedly stated that the Government should not be in the business of lending to college students, citing the profit made by the federal government on student debt. One estimate from the Congressional Budget Office has estimated a profit of $1.6B on federal student loans by the end of 2016. As a result, it is likely that the Trump campaign would put a significant emphasis on reducing the role of the federal government in providing and servicing student loans. In the absence of direct federal origination and servicing, there may be a call to reintroduce a program similar to the now defunct Federal Family Education Loan program (FFEL). This program allowed private lenders to originate and service loans that were then backed by the full faith and credit of the U.S. government in the event of a student default. If such a program did return, it would need to be significantly restructured to reduce taxpayer risk exposure, as FFEL acted like a bank subsidy for student loans in order to keep risk, and thereby lending rates, low. Reassessment of the Department of Education – Trump has stated that, "…the Department of Education is massive, and it can be largely eliminated," and echoed this sentiment several times since. However, outright eliminating the DOE is probably unrealistic given its extensive role in establishing policy for and administering federal aid, conducting research and collecting data on schools, and enforcing education laws. Still, its size and at least the perception that it is overspending has been a point repeated. Considering that both the Trump campaign and Republican party are looking at reduced federal involvement in lending, it would be realistic to expect a strongly reduced role for the DOE in general. RELATED: Hillary Clinton's plan for free college: Will you still need to save? Emphasis on private sector and state funding for higher education – A reduced federal government role would mean that shortfalls in college funding would need to come from other sources. This means that private lenders such as banks would play a larger role in origination and servicing of loans. It would reintroduce a market for firms such as SallieMae, whose business was directly impacted by the government largely nationalizing federal loan origination in 2010. Students may also lean more heavily on state governments, especially those who might otherwise have difficulty getting aid from private lenders. While this might seem bad for students on its face, reduced federal aid, higher rates from private lenders, and the increased scrutiny that would come with the greater role played by the private sector might actually help reduce college costs long-term. Students would be forced to look closely at alternatives, theoretically decreasing demand for traditional four-year tracks. The colleges themselves, with reduced federal funding, would also need to reassess ballooning administrative costs that are passed on to students. Expanded institution eligibility for federal aid – The Republican platform posits that federal financing should not be contingent on accrediting bodies. For 529 savings plan participants, this could mean being able to use your savings at any higher education institution, rather than the subset of accredited institutions. Given that the value of an accreditation has recently been called into question, and that it would mean more choice for students, this could be a good thing from a consumer standpoint. The downside is that it could mean more students using their federal aid at questionable education institutions. Pressure on college endowments that receive preferred tax treatment – In a campaign speech in Chester Township, Pennsylvania on September 22, Trump called out higher education institutions that "spend more on private equity fund managers than on tuition programs." Trump specifically stated that he wants to see universities spend money gained from federal tax breaks to more directly benefit students, such as tuition breaks and scholarships. RELATED: Does your school's accreditation mean anything? Emphasis on alternative learning tracks – There has been a growing backlash against expensive four-year higher education institutions building in parallel with mounting student debt, growing default rates, and the corresponding media coverage. Further, there is a pressing need for skilled labor in the United States, making trade schools and apprenticeships increasingly desirable. What form this emphasis on alternate tracks might take is unclear, be it policy, legislative proposals, or otherwise, but there is a strong undercurrent of potential support to encouraging alternative education paths. Risk-sharing – In May, Sam Clovis, director of policy for Donald Trump, stated in an interview with Inside Higher Ed that colleges should have more "skin in the game." Today the lender incurs the greatest risk in the event the student defaults on their debt payment. Clovis has stated and Trump has alluded that colleges need to be held more directly accountable for the outcome of their attendees. Whether that is in the form of financial risk should the student drop out, default on payment, or enroll in a career path with insufficient earnings potential to pay down their debt, the point is to more directly involve and hold accountable the higher education institution. This could involve holding the school partially responsible for missed federal loan payments, penalties for drop-out rates over a certain percentage, an equity-like stake in the career of the student, higher accreditation fees (notwithstanding the aforementioned decoupling of the federal aid program from accreditation), or other creative incentives. Regardless of what a Trump administration were to use as incentives and how they would be implemented, the desire is to motivate schools to change both their admission policies and programs that they offer. The theory is that schools that are choosier about who they admit and to what programs they are admitted would better ensure the success of those students. This would in-turn lower default rates, drop-out rates, and increase long-term financial success of all stakeholders. Reduced funding for students in fields with poor job prospects – Also in his interview with Higher Ed, Clovis spoke at some length about aid and loan eligibility being more directly linked with the student's earnings potential post-graduation. "If you are going to study 16th-century French art, more power to you. I support the arts," Clovis said. "But you are not going to get a job." College debt is a key voter concern this election, and while both candidates have provided insight on how they plan to address the issue, Trump has yet to issue a published stance. We hope to see more concrete guidance to voters in the near future. The Atlantic, Whose Responsibility Is it to Erase America's Shortage of Skilled Workers?